Sales tax is charged based on the total sale - not piecework. For example, if you sell an embroidered piece, your sales tax will be on the total amount you collect from the buyer - not for the materials used. Sales tax formulas vary by state and city, and in some cases, you may not be required to collect sales tax. Tax Tip: The purposes of sales tax is to collect revenue on behalf of a government or municipality and then pay it in installments - it does not count as profit income to your business. You do not have to keep track of every scrap of fabric as it goes out the door if this is too time-consuming. Aside from fabric, you have other costs including thread, seam rippers, patterns, buttons, needles, and even sewing machine oil. These are all legitimate costs of running your business that you can deduct from profits. There are several other ways to track inventory efficiently and it always best to consult with a professional accountant to determine the best method for you based on the size of your business and business structure. You can then reconcile your inventory at the end of the year for accounting purposes with simple math: The cost/value of your inventory at the beginning of the year minus the cost/value of your inventory at the end of the year will help you determine your cost of goods sold. The IRS cares most about the bottom line: what were your costs and what did you earn. If you are not sure how to factor costs and profits, just keep all your receipts for an accountant. If you cannot afford an accountant and are audited by the IRS, it will help you considerably if you have all your receipts in one place. If you have accounting software, most will allow you to set up a predetermined cost of goods sold. This can help you determine, over time, the average cost of each project. But it sounds like your dilemma is that some items use small pieces of fabric, perhaps even scraps and you are not sure how to price them as you go. The simplest method, until you have a history of expenses to average, is to go by the yardage. As you purchase fabric, slip a note to each piece with the total yardage and cost. If you cut a 1/4 yard for a project, you will know exactly what your costs are. If you have extra that goes into a scrap bin later for another project, do not count the cost of scraps a second time. Instead, take out the total cost upfront for the first project because even if you never use the scraps, discarded or waste materials can also be recorded. When you create a project from scraps, simply note it as "scraps." By setting up an inventory system the tracks all expenses, you can begin to average the cost of projects based on size. 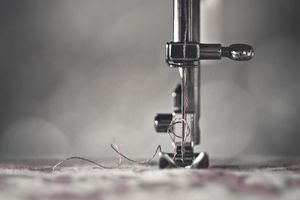 By always labeling fabric pieces with the yardage and price you can more easily determine the fabric costs, but do not forget to factor in the cost of your other sewing supplies at some point. Where Can I Donate Used Tech Locally, Nationally, or Internationally? How Much Extra Will Your Store Pay in Percentage Rent?